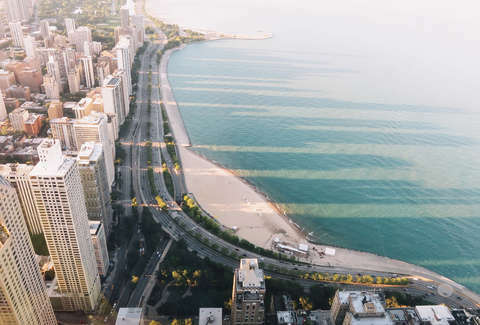 There’s no limit to the fun and tasty itineraries you can compose in a Chicago lifetime, but there are time constraints. So to make the most of your day, we’ve compiled some of the area’s best things to do (and eat) within a short drive. Or rocket flight, if you choose the planetarium adventure. Time to conquer your fear of Chicago’s incomparable heights. Take a cautious first step by stepping out onto the Skydeck at Willis Tower, Chicago’s highest observation point. Thrillseekers will be more interested in The Ledge, a glass box installed for maximum appreciation of the 1,353-foot view straight down. If that gets your blood going, why not get a little skydiving in? Experienced fliers, rookies, and even individuals with special needs, can take a couple flights at iFly’s indoor skydiving facility and skip the plane ride. With over 1,500 species and 32,000 animals, the Shedd Aquarium houses a lot of underwater friends to visit. One of the oldest and biggest aquariums in the world, the Shedd offers guided tours, focused habitat exhibits, and generally awe-inspiring creatures from the deep. Of course, staring at fish is going to make you hungry, so why not grab a fishing pole in the spirit of things and head to Chicago’s Riverwalk for a little fishing? Anyone with a fishing license (just $5.50 for a resident one-day license, $10.50 for visitors) can take advantage of it on the Riverwalk and try their luck with a catch. If you don’t quite land a big one for dinner, why not let the professionals make some for you instead? Skip the frozen filets and go for the fresh fish crudo at Nico Osteria, flown in daily from the Tsukiji Fish Market in Tokyo. Warning: you’re gonna need to loosen the belt about “two, t’ree” notches for this journey (or bring some hungry friends). Of Chicago’s hotly contested meat-based delicacies, Johnnie’s Beef is always in the conversation for best beef -- don’t dismay, the line moves quick. From there, a trip south to Ricobene’s for their infamous breaded steak sandwich will call for a few extra napkins. After a big glass of water and possibly some light aerobics, finish the night with a Maxwell Street Polish from Jim’s Original, the closest your mouth can get to having a Bears tailgate party inside of it. (Bonus: they’re open 24 hours a day, so wait until late and have your meat sweats in peace). Of all the towering pieces of architecture in Chicago, it’s easy to forget some of the most famous work is only a story or two tall. The Frank Lloyd Wright Home and Studio is an inarguable first stop, and luckily within walking distance of several other Wright designed-houses (he must have liked working from home). Once you’re done admiring the best of the Prairie School, graduate to skyscrapers via Shoreline Sightseeing’s architectural tours of Chicago. Your knowledge and pride for our city will both grow exponentially. For your last stop, head north to Wilmette and take in the Bahá'í Temple. In a city with almost ten thousand churches, it takes a lot for one to stand out -- suffice to say that this temple is for everyone, and should drop the jaw of anyone. When you take in the map of Chicago and see the little blip that is the Adler Planetarium’s jetty poking out into the water, it’s a funny way to put the city in perspective. 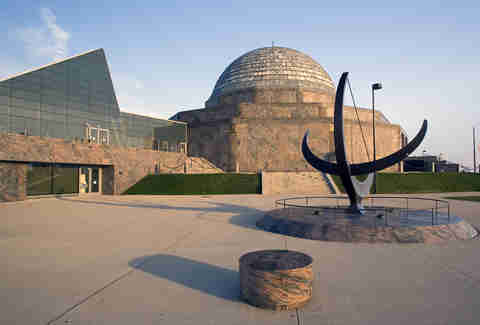 After a few mind-altering exhibits inside the Planetarium, you realize from space you can barely see Lake Michigan at all, and perspective gets pretty heavy. If your journey to the stars up north was fun, you can always add a follow-up trip south to star-gaze away from Chicago’s light pollution. And of course, you'll want a good photo op for the trip...snap one with Route 66’s original “Muffler Man,” the 30-foot tall Gemini Giant. If you’re feeling cinematic, Chicago has played the backdrop to some major movie moments. The Chicago Board of Trade Building and the block of South LaSalle in front of it is worth gaping at for any number of reasons, least of which might be the multiple movies that have basked in its platonic ideal of wall-to-wall skyscrapers (including Batman Begins, Transformers: Dark Side of the Moon, and Road to Perdition, to name a few). After hopefully minimal driving stunts, park at the Art Institute and stare slack-jawed at the pointillist masterpiece A Sunday Afternoon on the Island of La Grande Jatte by Georges Seurat as you try to see what went through the mind of Cameron from Ferris Bueller’s Day Off. For the big climax, gaze upon the Beaux-Arts beauty of Union Station from the top of the Canal Street stairs and channel your inner FBI agent from The Untouchables. (Just try to avoid any nearby baby strollers). Sometimes, daylight just ain’t right. 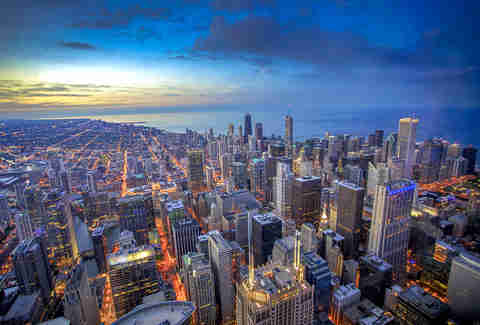 For those night owls out there, what’s to do in the Windy City? Start the night off with an inspired collection of retro and modern pinball and arcade cabinets at Logan Arcade -- perhaps nine other friends are down to play cult classic Killer Queen? If that doesn’t have your adrenaline pumping enough to keep the night going, some caffeine might be in order -- head north to grab a cup of coffee and hang with the artists at vegan/vegetarian pioneer Pick Me Up Cafe. Finally wrap your night up (or start your day) with an eating challenge beyond most mortals’ abilities: the Diner Grill’s infamous Slinger. Those who can eat a mountain of burger patties, chili, hash browns, and two eggs (with a side of toast, natch) might only win a cook-signed certificate of achievement; but if you’re hungry, you win either way. For the person who has everything, consider that they might only have everything tasteful. Pop into Oak Park’s Pumpkin Moon for kitschy cards, retro memorabilia, and unexpected action figures. If you still can’t find that special something, head North to Andersonville for a deeper dive into left field. Wooly Mammoth Antiques has skulls, rare collectables, creepy dolls, and even taxidermy. To check off any last boxes on one truly perplexing shopping list, the odds and ends of American Science and Surplus should suffice. Finding engine servos and pink musketeer hats in the same aisle seems like a small failure in taxonomy, but a big win in sheer exploring delight. You can buy everything here and the kitchen sink (or at least most of the parts for one).